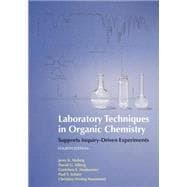 Laboratory Techniques in Organic Chemistry is the most comprehensive and detailed presentation of the lab techniques organic chemistry students need to know. Compatible with any organic chemistry lab manual or set of experiments, it combines specific instructions for three different kinds of laboratory glassware: miniscale, standard taper microscale, and Williamson microscale. It is written to provide effective support for guided-inquiry and design-based experiments and projects, as well as for traditional lab experiments. Jerry Mohrig spent his entire professional career as a college teacher. He retired in 2003 from Carleton College as Stark Professor in the Natural Sciences and Professor of Chemistry, Emeritus. Actively involved in science education reform for many years, Jerry was a founding member of the Council on Undergraduate Research (CUR) and of Project Kaleidoscope. From 1997 until 2000 he was Chair of the ACS Committee on Professional Training. During his career Jerry collaborated on chemical research with over 150 undergraduates and published many articles on the stereochemistry of organic addition-elimination and proton-transfer reactions. His first textbook for the organic chemistry laboratory was published in 1968 and over the years he developed several new experiments for the organic lab. His major recent interest is bringing more effective student learning to the organic chemistry lab through the use of guided-inquiry projects and experiments. Jerry has been honored with the CUR Fellow Award, the Briscoe Lectureship at Indiana University, the James Flack Norris Award of the ACS, and the Catalyst Award of the Chemical Manufacturers Association for excellence in the teaching of chemistry. Gretchen Hofmeister earned her Ph.D. in synthetic chemistry from the University of California at Berkeley in 1990, after receiving a B.A. in chemistry from Carleton College. She was an NIH Postdoctoral Research Fellow with Professor Richard R. Schrock at the Massachusetts Institute of Technology before becoming a member of the faculty at Gustavus Adolphus College, earning tenure in 2002. That same year, she moved to Carleton College, where she is now Professor of Chemistry. Professor Hofmeister has taught courses that cover the spectrum from organic to organometallic to inorganic chemistry. Her primary love is teaching organic chemistry, where she emphasizes reactivity and understanding reaction mechanisms. She has designed laboratory experiments at the intermediate and advanced levels that provide students with research-like experiences and expose them to sophisticated and modern synthetic techniques. Her research is focused on developing and understanding catalytic processes in order to improve the selectivity and efficiency of chemical transformations and reduce the adverse impacts of chemistry on the environment. After a sabbatical year (2008/2009) doing research in the laboratories of Karl Anker Jørgensen at Aarhus University in Denmark, she has shifted her focus to catalysts that are composed entirely of organic compounds. Professor Hofmeister has also twice served on the Organic Exams Committee of the American Chemical Society to develop the national standardized exam in organic chemistry. Christina Hammond, retired, was Lecturer and Coordinator of Laboratory Instruction in the Chemistry Department at Vassar College from 1981 to 2006. Hammond received a B.S. from the State University of New York at Albany, and came to Vassar in 1961 as a master’s degree student in chemistry and a graduate teaching assistant. She joined the faculty as a laboratory instructor in 1963. Her work concentrated on developing new experiments for these courses, and several of her experiments have been published in the Journal of Chemical Education. She has coauthored six organic chemistry laboratory texts published in the last 10 years.